The Trinidad Airport was begun in 1936 as a WPA project and was leased to the government in 1938. The Civil Aeronautics Authority contracted to establish a weather observation station there in May of that year. Perry Stokes arrived in 1944 to manage the airport for the City of Trinidad (owner of the facility at that time). While he ran a crop dusting business himself, he also coordinated the first commercial uses of the airport. In those days, TWA, Continental and Frontier were landing DC-3's on the runway. The terminal was finally built in 1951. In 1948, the City of Trinidad and Las Animas County made a swap: the airport for Central Park (in Trinidad proper). Up until the mid 1950's, Perry Stokes Airport had daily commuter service. Then the last of the big coal mines closed and business dropped off. The runway was repaved and extended in the early 1990's. 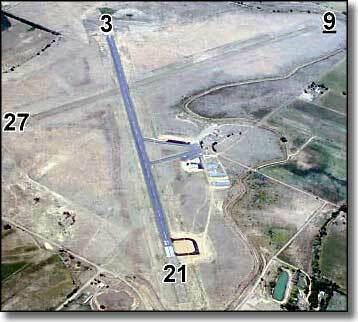 The runway proved its mettle in 1993 when the Colorado Air National Guard landed a Boeing 737 here. These days, Perry Stokes is used quite a bit by the US Army and by UPS. The hangars at the airport tend to be full and there are usually planes anchored on the tarmac. Recently, radio-activated runway lights went on line. In the spring of 2006, a major repaving project brought a new taxiway and a new tie-down area that affords more safety in the refueling area. As the 5,500-foot runway is rated for some military aircraft and even some jumbo jets, the future of Perry F. Stokes Airport is looking pretty rosy. Currently, the airport sees about 250 aircraft operations per month (landings, take-offs, refueling) and the County has a number of plans on the drawing board that would increase the value of this important resource to our area. RY lights and VASI pilot controlled lighting; 3 clicks for low, 5 clicks for medium, 7 clicks for high, use UNICOM 122.8. RY 09/27 rough and soft when wet. Agricultural operations in area. RCO 122.2, NDB 329, ASOS 119.25, App/Dep 128.375. For more info call (719) 846-6271, after hours phone (719) 846-3240. Noise/Landing Procedures: 6759' MSL light and heavy aircraft. Airport Services: 100LL, Jet-A. Attended Mon. - Sun. 0800-1800. The County is also trying to attract a Fixed Base Operator to manage the airport. Jet fuel and Avgas are available directly in front of the terminal building. Jet fuel accounts for almost twice the amount of Avgas used here. In 1984, Perry Stokes was inducted into the Colorado Aviation Hall of Fame. His achievements and long tenure as the airport manager were further honored when the County renamed the airport for him in the early 1990's. Perry died on Nov. 27, 1995. Perry F. Stokes Airport is actually located near Hoehne, about 12 miles northeast of Trinidad off US 350.